Dinya International Enterprises Nigeria Limited was Incorporated in 1983 as a foreign/indigenous Company with business in Building, Civil Engineering and Road Construction. In our 30 years of existence, we have handled projects for both private and government establishment. Our company is backed by qualified Engineers, Quantity Surveyors, Projects Managers and other workers to man our projects with up-to-date equipment. + Earth work ,surface preparation and asphalt for American Embassy, Abuja (Kouris Nig Ltd). + Construction of access roads for NNPC headquarter, Abuja (Bouygues Nig Ltd). + Road Network for Games Village, Abuja (CCECC Nig. Ltd). + Access Roads and parking lots of the National Stadium Complex, Abuja (Bouygues Nig Ltd). + Presidential Banquet hall access roads, Abuja (Bouygues Nig. Ltd). + Construction of 2 Nos Petrol Station at European Union Complex, Abuja. + Construction of access Road to National Housing programme Minna, Niger State. + Construction of access road and internal road for Shelter Concepts Ltd at new Lugbe a Private Estate Developer. + Construction of Access Road to Immigration Headquarters, Abuja. + External (Asphalt work) at Court of Appeal, Abuja (Bouygues Nig Ltd). + Re-construction and maintenance of Keffi - Nasarawa Road in Nasarawa State for FERMA. + Rehabilitated/reconstructed township roads at PAPU-T-Junction, Kuje Area Council, Abuja. + Rehabilitated/reconstructed township roads at ANGUWAN Gade Road, Kuje Area Council, Abuja. + Excavation of Rock and Earthwork at Jimmy Carter Shopping Complex, Maitama, Abuja (Horatio Nig Ltd). + Surfacing of Internal Roads and parking lot at Pinnacle Plaza, Maitama, Abuja (El Mansur Atelier Co). + Construction of Internal Roads, Kerbs and Driveways at Military Pension Board, Dutse, Abuja (Lubell Nig Ltd). + Construction of Access Road, Internal road and driveway at Cannan land for Shelter Concepts Nig. Ltd.
+ Construction driveways and parking at Rukayat Plaza, Jabi (Lubell Nig Ltd). + 2.4 km Dualization of Access road to Nigerian Navy post Service Housing scheme. 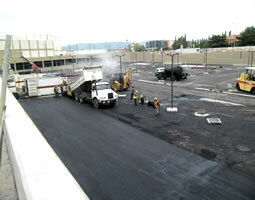 + Surfacing of Car Parks and Internal roads at Federal Secretariat and Foreign Affairs Ministry, Abuja (Bulet Nig Ltd). + Asphalt surfacing of driveways and car park at Shoprite Mall, Abuja (Dys Trocca Valsesia & Co ltd). + External works, Access Road & Parking lots at Nigeria Law School, Bwari, Abuja (A.G Ferrero Co Ltd). 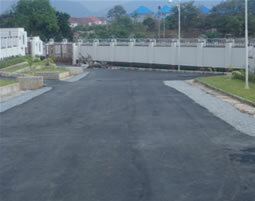 + External works, Access Road & Parking lots for NITEL Senior staff quarters, Abuja (Roger Rounal Nig Ltd). + External works, Access Roads & Parking lots for Shell IV Maitama, Abuja (Cappa & D'Alberto Plc). + Construction of Access Road and Internal Road at Life Camp for Bouygues Nig Ltd.
+ External work, Road work and Parking lots at Nigerian Minting and Printing Factory (Bouygues Nig Ltd). 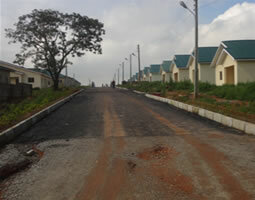 + External work, Road work and Parking lots for WAEC, Maitama, Abuja (G. Cappa Plc). + External works ,Internal road and parking Lots at Chief Nwude shopping complex Zone 4, Abuja (G. Cappa Plc). + Excavation of foundation at Ministry Of Foreign Affairs, Central Area, Abuja (G. Cappa Plc). + External works, Access Roads & Parking lots for ABB Staff HQ (G. Cappa Plc). + External works, Access Roads & Parking lots for TOTAL Headquarter Phase II (Fougerolle Nig Ltd). + Construction of Surface dressed Road from Shehu Musa Yar’Adua Express way to Immigration head office along Airport Road, Abuja (Eagle Construction Ltd). + Surface dressing and Asphalting of internal Roads of Presidential Airfleet, Abuja (CCECC Nig Ltd). 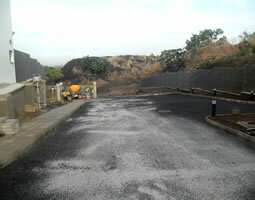 + Internal Road at Kafe District for Godab (Nig) Ltd, Abuja. 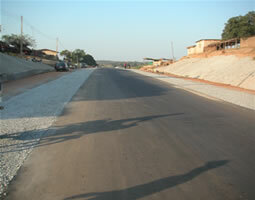 + Construction of 1.1km Dabara-Kwaba Road (Surface Dressing) for Suleja Local Government, Niger State. + Construction of Internal Roads and Car Parks for Nigerian Prisons Service at Airport Road, Abuja. + Asphalt Pavement of State Security Service (SSS) Quarters Karu, Abuja. + Construction of car parks and driveways at Cental Business district (Lubell Nig Ltd). 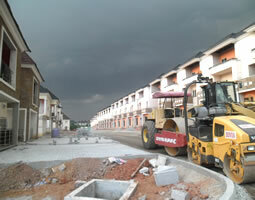 + Construction of Access Roads and Internal Road at Naval Estate Scheme, Karshi, Abuja. + Construction of Internal Roads, Car Park and Access Road for Nigerian Immigration Service (Eagle Construction Ltd). + Construction of Driveways, Internal Roads and Parking lots at Mabushi Ultra Modern Complex Mabushi, Abuja (Metroline Nig Ltd). + Construction of New car park at the Presidential Air Fleet, Nnamdi Azikiwe International Airport, Abuja (GTESC Ltd).